The 6' Custom 3 Sided Table Cover from AnyPromo is a customizable table cover designed for six foot tables. With an imprint are of 34" x 22" for Screen Printing, this table throw is perfect for prominently displaying who you're representing at a trade show or promotional event. If you're looking to buy a table or booth cover that you can use over and over, look no further. This table cover does not just offer function and style, but durability as well. The table cover is not only made with stain resistant, flame resistant, washable material, it features a rolled hem, non-fray seams and rounded corners. This custom table cover is a customer-voted "Top 100" item because not only does it turn a common folding table into a professional-looking branded space, it is extremely versatile. Table covers are commonly used by people promoting at grand openings, trade shows, health & job fairs, fundraisers, sporting events and more. 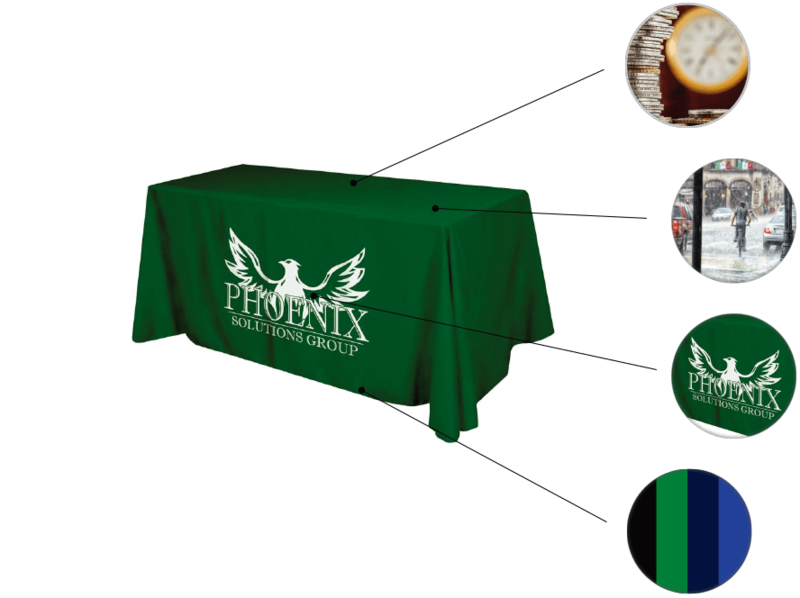 Cover your table in style at your next tradeshow, expo, or marketing event with this 6 foot table cover. 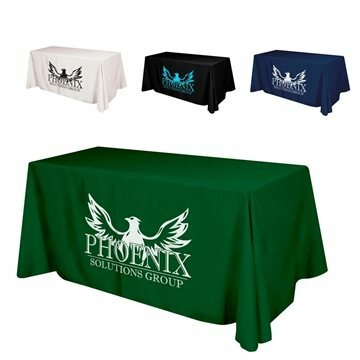 Draw attention to your table with a premium quality polyester table cover in a bright color with your logo or message on the front. These table cloths are stain resistant, flame resistant, and washable. The rolled hem and safety surged non- fray seams and rounded corners give the table cloth a nice finished look. Drapes the top and sides off the table leaving the back open making it easy to access and store items under the table. Fits a 30" high table. Easy to store so it can be used numerous times. If you're setting up to promote on a folding table, a table cover can do a lot for you. Decorated table covers can upgrade a simple folding table to a branded trade show booth. Available with black, hunter green, navy blue, royal blue, or white background. Screen printed with up to 2 colors on a 34" x 22" imprint area. Features rolled hems, no-fray seams, rounded corners, and made with washable polyester that's flame resistant and stain resistant. Available in 5 different colors and screen printed with up to two customizable PMS colors to match your branding. If you find this customizable table cover cheaper elsewhere, AnyPromo won't just match the price but beat it by 10% of the difference. Need a table cover in a rush? Get free 1-day rush production when you order this table cover with 1-color, 1-location printing. Product looks nice and will come in handy at trade shows and events. I just wish the logo was the true colors we uploaded. The triangle in the logo actually has 3 colors (Green, white and blue) but the cover has all green. Overall it's good. the rep helped me with our proof, ordering and then following up to make sure it got here on time--great job! Rosa was wonderful! She made sure that I received the items ordered by the time of my conference!